For a while I have wanted to do something for charity, you know more that occasionally putting spare change into a charity bucket. Also one of my New Year Resolutions was to do at least one completely new thing each month so doing a challenge to raise money for a charity would fit in well with this. 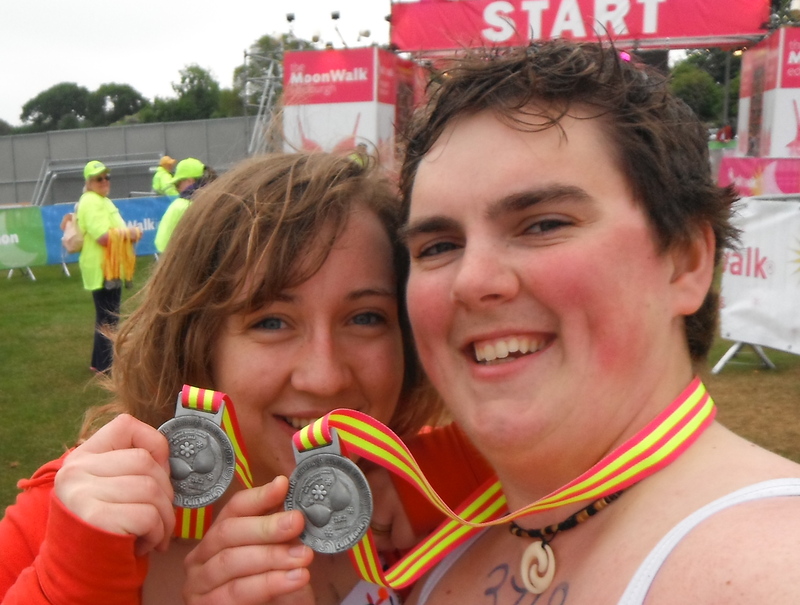 Had heard a few people talking about the Moonwalk in Edinburgh (http://www.walkthewalk.org/Challenges/TheMoonWalkScotland) and also knew a few people who had done it so at the beginning of this year signed up to do it along with my fiance. For people who don’t know what it is you walk around Edinburgh at night but you do it in your bra! You can choose to do various of distances, we did the standard one which is 26.2miles ( a marathon). The charity raises money for Breast Cancer, a very worth while cause as I think you find it very difficult these days to find someone who doesn’t know someone who has had breast cancer. Would have to say both of us didn’t really find the training that easy to do or enjoyable as really all about building up the distances: walking around the park 10 times not necessary a fun way to spend the day. However not all about the fun obviously so both of us were still very up for the challenge. The atmosphere before the walk began was great, one of my favourite parts was everyone doing the warm up together. Enjoyed the walk for the first 10miles or so and then it became a bit of a slog but needless to say we both finished in a time of 9 hours and 4mins. We both raised about £250 each. We had both thought that we would like to do a charity event each year so when I saw that you could do Ben Nevis at night for Alzheimer’s society (http://www.alzheimers.org.uk/) I knew that was our challenge for 2014. Starting to sense a theme of walking at night. Also one of our friends, Rachel was keen to do the challenge with us. Rachel has very similar thinking to wanting to do something for charity each year, she would have done the moonwalk with us but was focusing on going to Everest Base Camp for Childreach international (http://www.childreach.org.uk). A part of my job is going out to nursing homes to see people who aren’t able to attend the dentist in our clinics. A lot of these patients have Alzheimer’s in various different stages. Also it isn’t just in nursing homes either some of the patients that can attend are affected by the disease as well whether it is themselves, a family member or friend. Dentistry isn’t all about the teeth but obviously my job is involved with the mouth and I want to be able to do something more. I am very lucky that that my grandparents aren’t affected but one of fiances grandparents is so there is personal reason for doing the challenge as well. As well as being for a great cause I am also very much looking forward to training for the event and doing the walk, a lot more that I was for the moonwalk. In the past few months my fiance and I have just started doing Munros together. For people who don’t know what a Munros are, they are Scottish hills that are over 3000ft/914.4m, there are 282 of them. So far I have done 5 and Kat my fiance has done 2 but obviously we are both wanting to do a lot. Doing this challenge which give us a great incentive to do them as well as being training. Plus hopefully seeing the sun rise from the top of Ben Nevis will be amazing. I hope after reading this blog you feel like you might wish to sponsor our team, we need to raise £1200 but would love to get above this. No amount is too small. Below is the link to our fundraising page, the link will also be available on my homepage. Please have a look and share. This entry was posted in Charity and tagged Alzheimer's, Alzheimer's society, Ben Nevis, Breast cancer, Cancer, charity events, Conditions and Diseases, Edinburgh, Health, Moonwalk, Munro, Scotland by thatkitchendrawer. Bookmark the permalink.